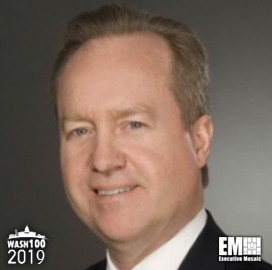 Executive Mosaic is pleased to introduce Thomas Kennedy, CEO and president of Raytheon, as an inductee into the 2019 Wash100 — Executive Mosaic’s annual selection of the most influential voices in the government contracting sector — for securing major contracts and helping to grow the company. This latest honor marks his third consecutive Wash100 Award win. Kennedy has served in his current position since March 2014 after holding several leadership roles at Raytheon for more than 30 years. Previously, he spent six years with the U.S. Air Force, where he attained the rank of captain. Kennedy said in an earnings call in January 2018 that he expected Raytheon to achieve thousands of orders for its proposed Naval Strike Missile over 10 years, a significant share of the potential $8B surface-to-surface missile market. He noted that the missile is ready to enter the production phase immediately after the contract is awarded. Raytheon secured two awards in January 2018 to address the missile needs of U.S. and foreign governments. The first is a potential $641.8M indefinite-delivery/indefinite-quantity contract to test ballistic missile defense system radar platforms. A second contract is a potential $500M foreign military sales award that tasks Lockheed Martin and Raytheon with providing Patriot missile system support services to the Saudi Arabian government. In March 2018, Raytheon received two more contracts to provide missile support to the Air Force. The first potential $511M award calls upon Raytheon to operate and maintain the Cobra Dane radar platform, which is intended to detect activities from foreign ballistic missiles during flight. The second award is a $523.1M contract modification to produce lot 32 advanced medium range air to air missiles for the Air Force and other FMS customers. Kennedy serves as chairman of the Aerospace Industries Association’s Board of Governors, which seeks to foster competitiveness in the global aerospace industry. He also serves on the Business Roundtable, the Massachusetts Institute of Technology’s Presidential CEO Advisory Board, the Rutgers School of Engineering Industry Advisory Board and the UCLA Engineering Dean’s Executive Board. He holds patents for technologies related to radar and electronic warfare. Executive Mosaic congratulates Thomas Kennedy and the Raytheon team for their selection to receive this award.